Preparing a datapackage means composing a folder containing the data that you want to Submit to the Vault. A datapackage only exists in the Vault but is prepared in the Research area. If you choose a folder in your directory structure in your Yoda Research area and submit it as datapackage, Yoda considers that folder, its subfolders and all of its contents as one unit which should be copied as a datapackage to the Vault. 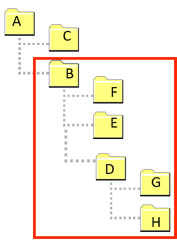 If this is the file structure in your research area you could decide to make a package of folder B. As all B’s subfolders will automatically be in the package the red rectangle is packaged. the structural Yoda metadata you’ve filled out in the portal. manually by the Yoda Data Manager. What exactly should be considered to be ‘your data’ is up to you. Given your folder-structure in your Yoda Research Area you choose a folder and submit it as datapackage. The Yoda environment then considers that folder, its subfolders and all of its contents as one unit which should be copied as a datapackage to the Vault. Submitting a datapackage implies copying data from the Research Area to the Vault, not moving. The folder-structure in your Research Area remains in place and can be used for the creation of new datapackages in later stages of your research. Note that storing a datapackage in the Vault does not automatically Publish the datapackage. This is a different function. Point at a folder in the folder-tree in one of your usergroups and submit it to the Vault. The system will automatically check whether all mandatory fields of the metadata-form defined for that folder are filled out correctly. You’ll receive a system message if this check fails. If the metadata-form passes validation, the folder and all its subfolders will be locked and receive the status Submitted. If desired the folder can be Unsubmitted, using the same button. The Yoda Data Manager will be notified that a datapackage is submitted for the Vault. The Data Manager will then perform manual checks to validate the quality of the datapackage and will either Accept or Reject the datapackage. Please read Checks by the Data Manager to learn what exactly this qualitative check entails. Once the datapackage is accepted, it’s status will change to Accepted. The folder in the Research area will remain locked and can’t be unlocked. After a while the datapackage is actually stored in the Vault and the status is changed to Secured (refresh screen to see this). In this status the folder in the Research area can be unlocked.